Originally developed for military applications, the lead-free Varmint Grenade delivers sniper-like accuracy for dependable long-range kills. The hollow-cavity, flat-base bullet features a copper-tin powdered metal core surrounded by a gilding metal jacket. The bullet remains intact at ultra-high velocities in fast twist barrels, while its highly frangible core fragments violently on impact, virtually vaporizing ground squirrels and prairie dogs, even at long range. 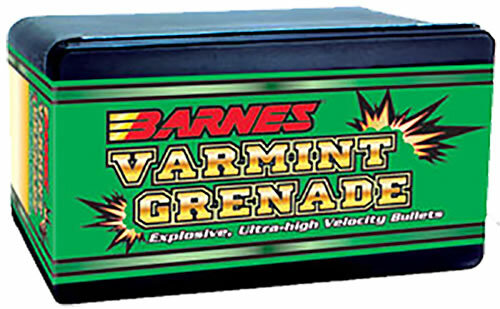 Varmint Grenades instantly expend their energy, seldom exiting large predators like bobcats and coyotes, leaving valuable pelts virtually undamaged. Because of the Varmint Grenade's construction, it produces the best accuracy results when seated off the lands and grooves .020".